If you haven’t participated in a runDisney Star Wars event — because you don’t think you’re a good enough runner, or you’ve never run in an organized race, or you don’t consider yourself a runner at all — you should consider reevaluating your position. The folks at runDisney make their events welcoming to participants of all experience levels, and they bring an element of fandom fun you don’t usually get while exercising. Here are six reasons why you should try runDisney’s events — including the upcoming Star Wars Half Marathon – The Dark Side weekend — even if you don’t categorize yourself as a runner. 1. Take a relaxed approach. Just because you’re participating in a running event doesn’t mean you have to make it a race. And actually, you don’t even have to run. 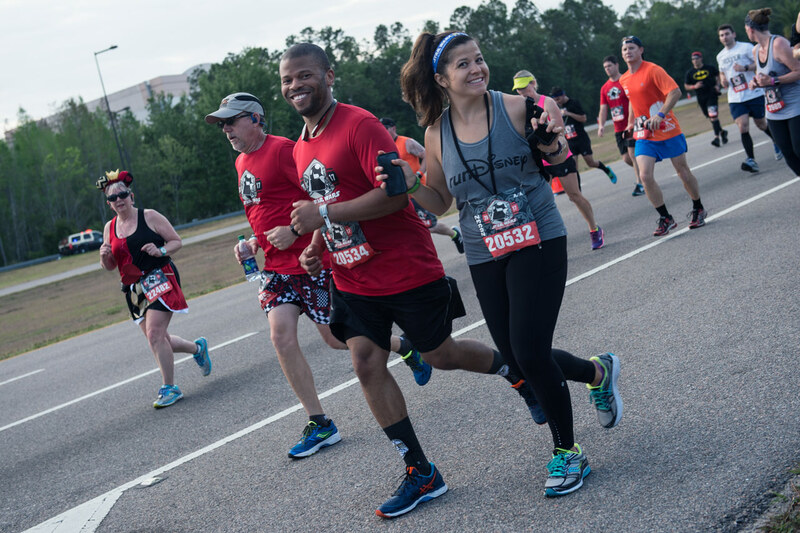 You do have to meet a 16-minute-per-mile pace for all of runDisney’s events, but you can achieve that with a combination of walking and running or even a brisk walking pace. So, yes, you can walk the entire course or slow down whenever you need a break. Save a burst of energy for the last stretch to appreciate the glee of running across the finish line. If you are moving slower than others, stay to the right side of the course. Other runners can pass on the left while you move at your own pace, and you can enjoy the experience on your own terms. Many of your fellow fans know the feeling of being self-conscious about exercising in front of others or being around people who can run much faster. One of the advantages of signing up for a runDisney Star Wars event is that you’ll be around other fans, probably including some familiar faces. Think of it as being like Star Wars Celebration but on a running course. It’s a comfortable atmosphere that makes trying new things less scary. You’re among supportive people, often covered in Star Wars gear, who will have your back. And remember — every experienced runner had to start somewhere. 3. Pose in the wampa cave. runDisney’s races start before Disney Parks open. Depending on the course, this can mean a unique opportunity to go through a quiet and relatively empty theme park. While you’re taking that in, you’ll notice stops along the course for special photo opportunities. Maybe you’ll come across C-3PO and R2-D2, or maybe you’ll get an encouraging hug from Chewbacca. You can make pausing for every photo part of your plan, kind of like a game. And as an added bonus: waiting in lines for pictures will give you regular breaks from walking or running the course. Like to wear costumes or come up with inventive fandom outfits? Then you will enjoy designing your own running ensemble; it’s one way to engage yourself with racing. Fans come to Star Wars races in everything from typical running attire to pajamas covered in BB-8 to costumes made for movement. Search for photos from past runDisney events for inspiration, check their website for outfit restrictions, and then let your imagination run wild. You’ll have plenty of chances to show off your sense of flair with the photo opportunities mentioned above and the all-important finish line image. 5. One race at a time. runDisney race events take place on weekends, Friday-Sunday, with three separate courses: a 5K, a 10K, and a half marathon. Though some runners commit to every race, don’t feel like you have to follow suit. No amount of running or walking is small. In fact, the 5K is an ideal race length to put your feet on pavement and try runDisney. You can build your own race menu for the weekend, maybe completing one course, wearing the medal you worked so hard to get, and then rewarding yourself with a day at Walt Disney World riding Star Tours. 6. Your own Star Wars medal ceremony. Luke and Han received medals for blowing up the Death Star, and thanks to runDisney, you’ll get your own Star Wars medals, too — which might be cooler than what Leia awarded our heroes. Each race has its own unique medal, and they’re all beautifully designed and sculpted, from the executioner stormtrooper for this year’s Star Wars Half Marathon – The Dark Side 5K to the Kessel Run’s Millennium Falcon medal. runDisney’s Star Wars medals are Star Wars items like no other; they mean a lot to those who have earned them, and this new batch is waiting for you. runDisney’s Star Wars Half Marathon – The Dark Side takes place at Walt Disney World on April 19-22, 2018. Check out this year’s medals for runDisney’s Star Wars Half Marathon – The Dark Side! Amy Ratcliffe is a writer obsessed with Star Wars, Disney, and coffee. She is most definitely not a runner, but she loved doing a runDisney 5K. She co-hosts the podcast Lattes with Leia. Follow her on Twitter at @amy_geek. This entry was posted by Star Wars in Black Series, Books, Books + Comics, Chewbacca (Star Wars) | Characters | 4f7a5c94cb6c2d69de13c002, Chewbacca Noodle Rolls, Collecting, creatures, Daniel José Older, Disney Parks, Events, Ewok Hunt, excerpt, Games + Apps, Han Solo (Star Wars), Hasbro, Interviews, Lando Calrissian (Star Wars) | Characters | 4f7a5c9dbac94d69de13c002, Last Shot, Millennium Falcon, National Pet Day, Night on Endor, Polls, Quizzes + Polls, recipe, Recipes, RunDisney, runDisney Star Wars, Solo: A Star Wars Story, Star Wars Books, star wars recipes, star wars toys, Star Wars: Battlefront II, Star Wars: The Black Series, Toys. ← Poll: What is Your Favorite Moment in the Solo: A Star Wars Story Trailer?